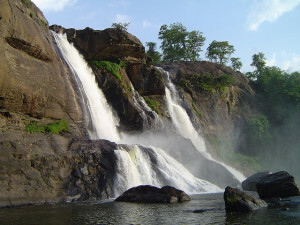 Athirappilly Falls is located in Athirappilly Panchayat which is in the Thrissur district of Kerala. It is located on the southwestern coast of India and on the Chalakudy River which flows towards the west. The river is situated near the Sholayar ranges and the Vazhachal Forests Division. The height of this waterfall is approximately 80 feet and is one of the best spots for tourist during the tourists’ season. It was said that a hydroelectric dam would be built on the river Chalakudy. But this is a controversial topic and is in news since 1990’s. The Chalakudy River is almost 145 kms long and its source is in the Anamudi Mountains which is located in the Western Ghats. This river flows through the Vazhachal forest and keeps on flowing towards the Arabian Sea. Normally the flow of the river is smooth but when it reaches Athirappilly it becomes turbulent. The water of the river surges around the huge rocks in the river and then divided into three plumes. The river remains in high velocity until it reaches Kannamkuzhi. When it reaches the Thumburmuzhi dam it becomes quite and again begins to flow smoothly. There are many kinds of wildlife present in this area that includes tiger, bison, leopard etc. This wildlife has made this place enriched. 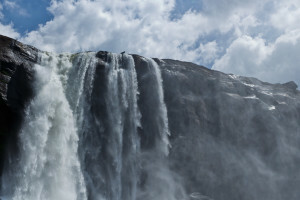 The best time to visit Athirapally falls is just after the monsoon season, September onward, when the waterfalls would still be in full motion.